Still not finished shopping for Christmas gifts? 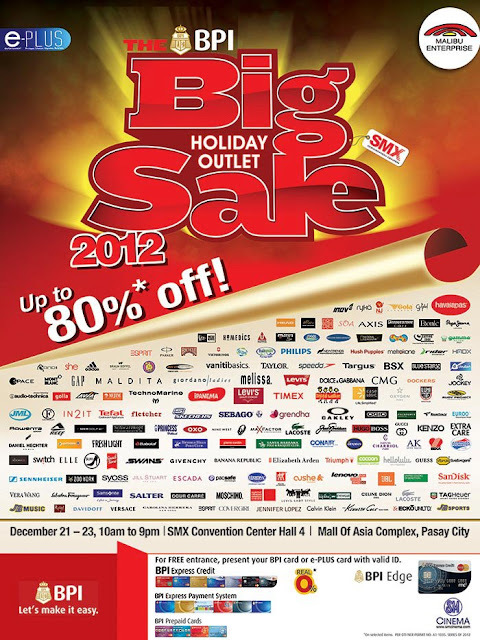 Why not save the date for the BPI Big Holiday Outlet Sale 2012 to shop? It's gonna be at SMX Convention Center Hall 4 at MOA- Mall of Asia Pasay City on Dec 21- 23, 2012. Lots of brands will join the sale like: Melissa, Levis, CMG, Maldita, GAP, Kenneth Cole and more.